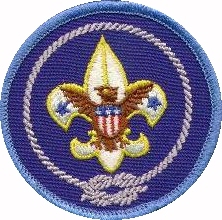 The International Activity badge (#00144) was a 3-inch diameter patch which was worn as a TEMPORARY EMBLEM on the right pocket of the Scout or Scouter. It was awarded to recognize participation in unit, council, and world scouting international activities. It was NOT worn in place of or alongside the World Crest emblem. There was also a 5-inch jacket patch (#00145) available. Each local Council had the authority to determine requirements for the patch. There was no time restriction for earning the patch. The unit leader, or his designee, determines eligibility. From among the 3 categories, a registered youth or adult must earn 100 points. Conduct an international project such as UNICEF, United Nations Day, etc. Participate in a BSA event with a World Brotherhood theme such as Expo, Day Camp, Summer Camp or Camporee. Visit a Cub Scout group or a Boy Scout group in another country. Host a Scout or Scouter from another country. Participate in Jamboree-On-The-Air, or similar Scouting program. Participate in an international theme program at a troop or pack meeting. Visit an international organization, embassy or World Bank and learn more about what they do. Visit an international civic club and learn about their international activities. Assist at an IVIS (International Visitors Information Service) booth at a train or bus station or at an airport. Participate in the Cub Scouting or Boy Scouts Pen Pal Program. Collect international Scout badges, pins or Scouts on Stamps and display at a troop, pack, or other Scout meeting. Participate in a collection for Scouting¹s World Friendship Fund. Earn the Cub Scout or Boy Scout World Conservation Award. Attend/participate in a World Jamboree in another country or a BSA sponsored Scouting Tour in another country. Cub Scouts only: be able to converse in a foreign language. Participate as a member of your unit or a contingent unit in an activity outside of the United States. This must have a minimum duration of three days and two nights. Participate as a member of your unit or individually host a group or individual scout from another country during their visit to the United States. This must have a minimum duration of one day and night. Participate in a camporee or scheduled event in which scouts of other nations are involved. This must have a minimum of three days and two nights. Serve as a counselor in the European Camp Staff program.